Rubino – Minimal & Creative PSD Template Created by YoloPSD. This templates have specific characteristics, namely: Rubino has features such as High Resolution: No, Layered: Yes, Minimum Adobe CS Version: CS6, Pixel Dimensions: 1920×10000 . 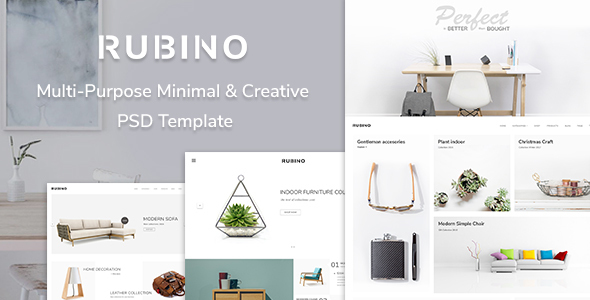 You can use this Rubino – Minimal & Creative PSD Template on Psd templates category for builder, clean, ecommerce, flat, minimal, mobile, modern, portfolio, shop, shop creative, store and another uses. Rubino is a minimal, creative and modern design for minimalist websites including Portfolio, Shop, Product design, Agency, Blog, Photography, Showcase types and Business site as well. This versatile template allows users easily customize their unique site with more than 8 attractive homepages, 5 portfolio layouts, 7 shop pages and more which are fully layered and editable PSD files. Users will find Rubino the dedicated and trendy features as a new wind of the creation into their own site. 45 fully layered and editable photoshop files.